UII’s lnformatics Engineering (TF) Study Program UII was founded in 1994. UII’s TF vision is “determined to be a global oriented national reference that yields individuals enabling effective and noble information technology solution”. Efforts to realize such vision can be seen from the study program’s achievements. 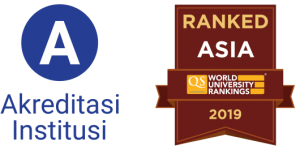 In 2015, UII’s TF earned “A”accreditation based on the Decree of BAN-PT No. 990/SK/BAN-PT/Akred/S/IX/2015. In the field of research, UII’s TF Study Program managed to be one of the top 10 Informatics/Computer Engineering Study Program in Indonesia which has many Kemenristekdikti’s publications in 2016. The students have various achievements, both at the national and international level, such as the first place in Pertamina National Science Olympiad, second place in Cisco Net Riders, first place in National Business Plan Competiton, and many others. UII’s TF Study Program has training institutes that provide a variety of internationally certified trainings such as Cisco, Oracle, Ethical Hacking, Computer Hacking Forensic Investigators, Adobe, MikroTik, and so on. In addition to being used as part of the Diploma Supplement Certificate (SKPI), these certifications can also be use as added values for students to increase their selling point. In addition to hard skills, students are also equipped with various soft skills improvement programs to provide adequate ammunitions to deal with what awaits them after graduation. UII’s TF Study Program is committed to produce graduates that enable information technology solution. These graduates will have top notch skills to perform as system analysts, designers and developers of information technology solutions and equipped with personal qualities making them ready to become value-based leaders, entrepreneurs, and lifelong learners. The study program is currently implementing the 2016 curriculum, which uses the great concept of “3+1”. Through this curriculum, students are required to study on campus for 3 years to master their knowledge and skills, while the last 1 year is used to learn how to live within society and become beneficial individuals. With this concept, students are given the freedom to choose 1 out of 5 paths according to their interests in the field of information and communication technology (TIK). The five paths are: a) research, for those who want to be researchers and lecturers; b) community service, for those who have a high passion to socially contribute to the people in the field of TIK; c) business pioneering, for those who have entrepreneurial spirit and eager to build startups dealing with TIK; d) foreign education, for those wishing to improve their knowledge and expand their insights and international network; and e) apprenticeship, for those who desire to perform a variety of TIK jobs such as software architect, data scientist, software engineer, develops engineer, mobile developer, front-end developer, software developer, and many others.